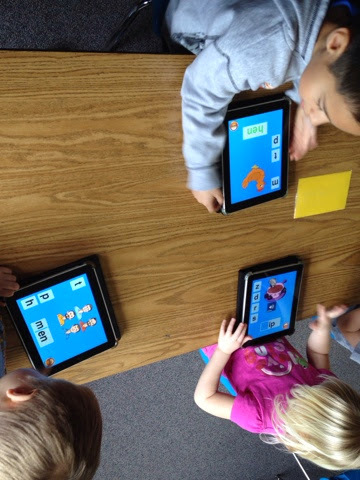 Digital Kindergarten: My iPad isn't working right! Now what?! My iPad isn't working right! Now what?! My iPad isn't working, now what?! Anyone who has attended one of my seminars or talked with me about technology in the classroom knows I'm appnoxious about Apple products. Yes, I know that other tablets are usually cheaper. IPads and MacBooks are investments in my opinion. While they may cost more initially I believe they more than earn their way once the user is trained and had learned how to effectively use them in the classroom. One of the reasons I love Apple products is that they work. They are reliable and sturdy and are quick to turn on, ready to use almost immediately. All three important qualities for classroom use. However, they are electronic devices, made from lots of tiny parts and run by complicated (to me) processes. Sometimes those tiny parts and complicated processes don't work together even on an Apple device. So what do you do when you have a problem with your iPad, or for that matter, any piece of technology? Do what I do and Google it! I will explain a few iPad specific tips below for solving some common issues. However, if your specific issue isn't mentioned, before you email me, just Google a brief description of the problem. Almost every problem under the sun will have a few possible solutions somewhere on the World Wide Web. Most often a Google query about problems with the iPad will result in many pages with fixes from the Apple Support Community. More often than not one of the first suggestions solves my problem. I was given the option to wait or schedule a call back time. I chose the call back since it was late at night and got a call within two minutes of the time I had requested. So your iPad (MacBook, tablet, computer) is misbehaving- what now? Today's problem that prompted this post was all my third party apps (apps not made by Apple) were crashing as soon as they were opened. After restarting the iPad and closing all the apps that were open I Googled 'apps won't open on iPad' or something similar. The first solution on the Apple Community page was to install a new third party app. This was such an easy solution and worked immediately. I may have skipped having to find an app to download just me signing out of the iTunes Store and re-signing back in, but I won't know until the next time if I have the same problem. The solutions I'll post next are all iPad specific, but just keep in mind for any question or problem- Google. If Google doesn't have an answer for you I'm not sure it exists! ;) Ok, so I'm goonoxious too. 1) Close by pressing the HOME button (round button on bottom of screen). Reopen the app. 2) Swipe up OR push the home buttons quickly two times in a row. This will bring up all the open apps running in the background on your iPad. Swipe up on the image of the app to close it. Reopen the app. 1)press and hold down on the home and power buttons (round button on bottom of screen and oval button on top right of the iPad) until the screen goes black and the white apple icon appears. It will take 5-10 seconds. When the home screen comes back on swipe and see if it's working again. If those solutions don't work, be sure to Google the problem. Check for updates on the apps and iOS. Occasionally an app or iOS updates and doesn't play nicely- you may need to be patient and wait for a fix. Pick a Device, Any Device!